On April 9, I'll be presenting a 90-minute webinar for Early Childhood Investigations. This free webinar will be part of the Follett Growing Readers Series of online professional development for early childhood educators and others who serve young children. 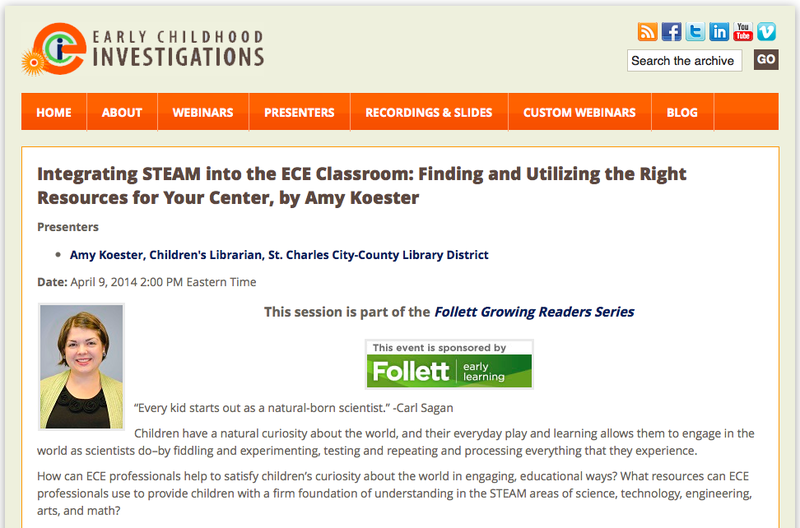 My webinar is titled Integrating STEAM into the ECE Classroom: Finding and Utilizing the Right Resources for Your Center. I'll be reviewing what STEAM is and how it applies in early childhood classrooms and services. I'll also highlight a variety of options for implementing STEAM activities, as well as resources to support all things STEAM in the early childhood center. For more information and to register for this webinar, please head over to the official Early Childhood Investigations page for my session. The session will be recorded and archived in case you are unable to attend live. I am very much looking forward to promoting what libraries are doing with STEAM for preschoolers, and especially to singing from the rooftops what a stellar resource the library can be for ECE centers looking to integrate STEAM. The weather in Missouri, like in much of the country (world? ), has been a bit wonky this winter. That's provided many preschools, daycares, and families with ample opportunity to talk about the weather quite frequently, and it helped me to choose my March ukulele song. We've been talking lots about snow and rain and sun and the like; but what if we got a bit silly and turned that weather into candy? Yum. 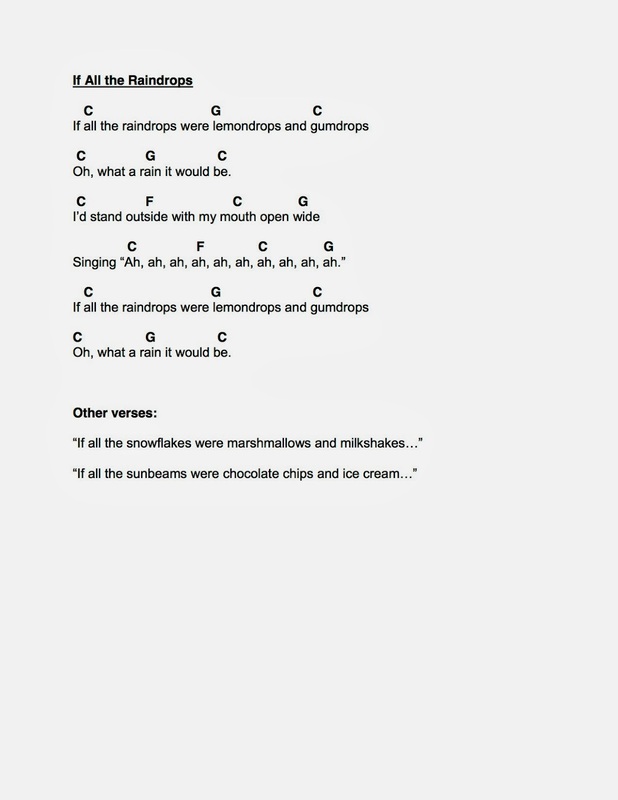 Also, the "mouth open wide" part of the song is always, always, always a hit. It is possible that you should decide to offer a space-themed unprogram during spring break. It is possible that 30+ highly energetic, highly imaginative children will attend. It is possible that one of said children will pretend he has concealed a space knife, which is mostly similar to a real knife, on board the spaceship. It is possible that said child will commit the first space murder. It is possible that a group of fellow space travelers will elect to create an ad hoc jury to bring said murderer to justice. It is possible that said murderer will be sentenced by said jury to be dumped into the atmosphere of Venus to fry in retribution for said murder. It is possible that all of these things will happen without any hint or suggestion from the librarian/space captain. It is possible that all the children/astronauts will find it highly amusing. The introduction: As the astronauts assembled in the program room/spaceship, they each found a seat at a table, which had been assigned a pod number. These would be the astronauts' pods for the duration of our space voyage. 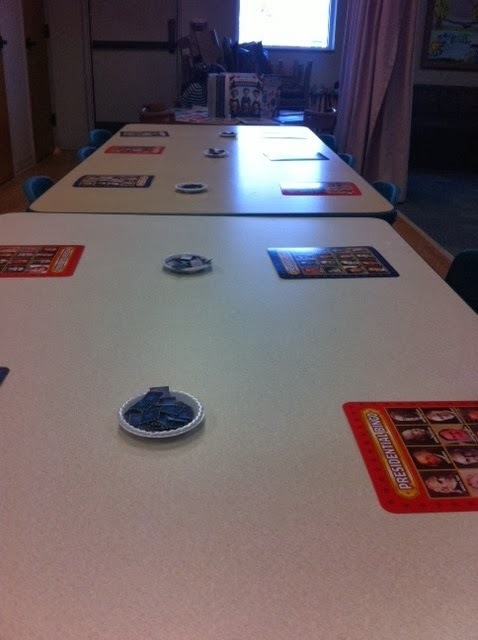 While waiting for all the astronauts to arrive, podmates could play games of concentration using a deck of cards showing different spaceships, real and fictional. Building Shelters - Luckily this moon seemed to be littered with LEGOs, which provided the building materials. I prepped small cups of LEGOs on a table, and the astronauts used robot hands to grab and carry them back to their pods, where building shelters could commence. Rations - An astronaut has to eat, so we rationed out some astronaut food--freeze dried ice cream. Staving Off Space-Madness - An assortment of brain-feeding materials were available, from books about space and space exploration, to stories about aliens, to the aforementioned spaceship concentration game. The wrap-up: After we finally figured out how to fix our spaceship, it was time to head home to Earth. As a group, we made sure our spacesuits were on securely, and we buckled into the ship. I split the crew into three groups, each responsible for part of the takeoff, flying, and landing process. Setting foot on Earth again after so much time away was wobbly, to be sure, but oh, did it feel good. I'm over on The Library As Incubator Project website today to talk about hacking the STEM potential in a relatively straightforward arts program: creating aliens out of recycled materials and craft supplies. I'm thrilled to be able to share some strategies for turning traditional arts and crafts programs into uber-engaging STEAM programs. Head over to LAIP to get full details on how you can have this program invade your library! The Synopsis: Michelangelo's statue of David is considered a masterpiece, but it started out like any other marble sculpture: as a slab of stone. This picture book chronicles how Michelangelo's David came to be, detailing why Florence wanted the statue in the first place, how hard the artist worked on it, and how it was received when it was finally revealed. The text concludes with an informative author's note and bibliography. The Review: This short, straightforward non-fiction picture book provides so much detail surrounding one of the most famous works of art in the Western world. Sutcliffe obviously believes that having the context for great works of art is integral to appreciating them, and she makes sure her readers understand why the David statue was and continues to be important. Shelley's illustrations add a great level of interest to the book, with intricate borders and side illustrations that depict every aspect of this statue's life--from the biblical inspiration, to the sculptor's tools, to the process of moving the enormous statue after its completion. Sutcliffe and Shelley combine to offer a comprehensive, interesting, and kid-friendly introduction to Michelangelo's marble masterpiece. The Programming Connection: I'd take either the art historical or the engineering/art routes for programming with this title. In terms of art history, this book lends itself to a program in which many famous works of art are explored for their context and how they were created. On the engineering/art side, I would use the book in a program about creating with negative space. We'd have blocks of clay to sculpt into our own creations by chipping away at the parts we do not need. Not a simple process! 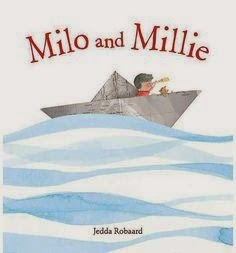 The Synopsis: This quick picture book follows Milo and his bear as they have a sailing adventure in an origami boat. At the end, the reader discovers the adventure was only an imagined tale taking place during Milo's bath. The book includes instructions for making an origami boat. The Review: This simple story comes beautifully to life in Robaard's watercolor, pencil, and collage illustrations. There is much to enjoy and appreciate here--the brevity of the text, which mimics a young child's storytelling; the gorgeous and minimalist illustrations; and the ultimate realization what we can imagine all sorts of adventures for ourselves. A lovely, quiet book to share with preschool-age children. The Programming Connection: I would absolutely use this book in storytimes, taking care to talk about the beautiful illustrations. On some pages, we could talk about shapes; on another, animals; on a third, what a whirlpool is. I would also love to use this book in a program in which the children can fold their own origami boats, then describe the adventures that they go on inside of them. See February's STEAM Reads Roundup here. When I first announced my 2014 goal to create a felt story or activity each month, I got a lot of encouragement from Flannel Friday-ers. I also got a fair number of recommendations for simple felt stories that really pack a punch with kids. One of the most recommended was "Little Mouse, Little Mouse." Readers, I was skeptical. 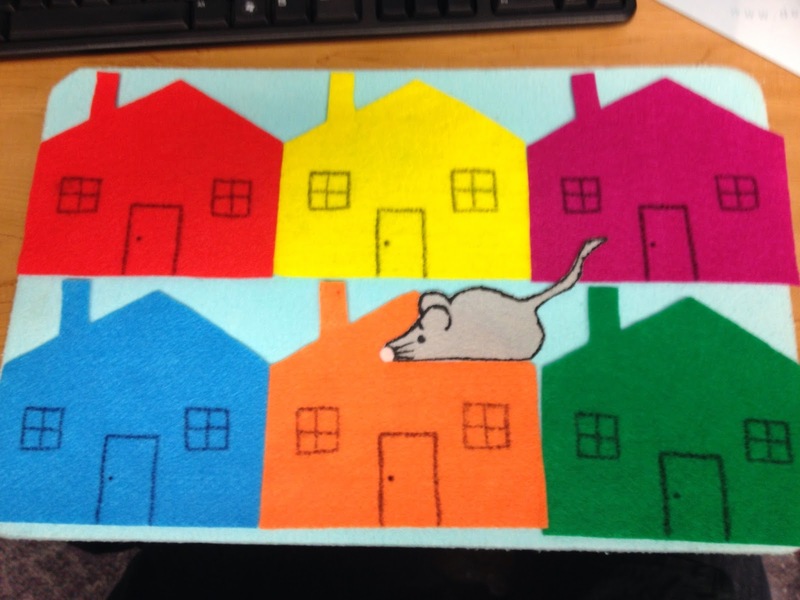 You see, the entirety of "Little Mouse, Little Mouse" is a felt mouse hiding behind one of several differently-colored felt houses. When the mouse is successfully hiding, the entire group chants together: "Little mouse, little mouse; are you in the *color* house?" The person leading the story then pulls back the appropriately-colored house to reveal whether the mouse was hiding there or not. Simple. But, oh. The excitement! The cheers! The absolute disbelief when the mouse was not to be found inside a particular colored house, and then the absolute joy when it was discovered! The moral of this story is: Make this felt board. It is simple and straightforward from the creator's perspective, it reinforces color knowledge and ideas of object permanence, and kids completely adore it. I can still hear them chanting: "Little mouse! Little mouse!" Check out this week's full Flannel Friday round-up on Katie's blog Story Time Secrets. The 2014 PLA Conference in Indianapolis was a great one. I got to attend some outstanding sessions by dynamic librarians whose words are certainly feeding my professional development; I broke bread with a number of excellent library land friends and colleagues, some of whom I met IRL for the first time in Indy; and my presentations went off quite well. As I have come to do after conferences, I am sharing a recap and some of my greatest takeaways here on the blog in hopes that you might enjoy some free PD! On Saturday morning of PLA, Brooke Rasche and I co-facilitated a Guerrilla Storytime. So many storytime providers participated in the session, and the result was fantastic skills sharing. I put together a full recap for the Storytime Underground. And last but not least, I filled in for Marge Loch-Wouters on a session about advocating for youth services at the library, community, state, and national levels. I wrapped up the session by sharing some tips for using social media as a tool to champion the work happening in youth services. Check out the Pinterest board that co-presenter Rhonda Puntney Gould and I put together to gather advocacy resources. These are the biggest, most services-transforming ideas I brought home with me from PLA. I truly hope you'll read the ideas, think about them, and start a conversation about them (preferably with me, but really, with anyone!). These are the ideas I want to think more about so that I can apply them to the work that I do in my library and career. And that's why every storytime provider, every youth services librarian should mindfully make sure that their programs and readers' advisory suggestions aren't just propagating heterosexism. Even when you take away the books and programs that purport to appeal directly to boys OR girls (a restrictive binary in and of itself, and off-putting to many), there is a lot of background heterosexism in books. We owe it to the children and families we serve to not exclude anyone or make anyone feel uncomfortable or unrepresented, even unintentionally. I will most certainly be thinking about this topic much, much more, with respect to my library's programs and services and also to the profession as a whole. Suffice it to say, more on this later. Because it's big, and it's important. In her most excellent, The Outsiders-themed SparkTalk, Megan talked about inevitable librarian burnout and ways to stay gold. Namely, she advises refreshing and restarting on a day-to-day basis. That, and doing the professional development you want to do and not just putting it to the side "for later." Read those articles. Check those blogs. Have that convo on Twitter. Then, when you go work with customers, you'll be in a much more refreshed, informed mindset. I most sincerely hope that Julie will convert her SparkTalk into a blog post, as her viewpoint and message are much needed in library land today. Namely, that speaking out about the unbalanced, alarmist, and privileged attitudes coming from the librarians with public soapboxes can most definitely be commented upon and criticized--and should be, if we want to learn from it and change the professional culture for the better. What were your biggest takeaways from PLA? Let's chat!! On March 25, I'll be co-presenting an ALSC Student Sessions webinar with my fellow Storytime Underground Joint Chiefs, Cory Eckert (2014 Library Journal Mover & Shaker, w00t!) and Kendra Jones. Since it's a student session, the webinar is FREE for anyone interested, regardless of whether you're an ALSC member. All you have to do is register. Cory, Kendra, and I will be talking about creating your own personal learning network (PLN) and then making it work for you. This ALSC Student Session will include the PLN stories of the Storytime Underground founders, and we'll be sharing a variety of strategies for building and maintaining PLNs; using PLNs to meet and collaborate with colleagues; and approaching the PLN through the lens of professional development. Check out the full, official details for the webcast below, straight from the ALSC website. 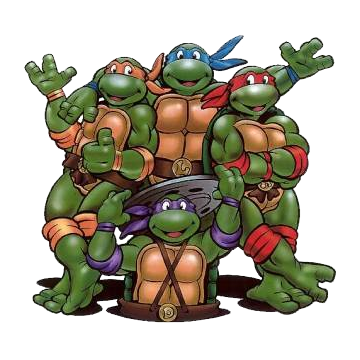 We hope you'll join us (and enjoy our Teenage Mutant Ninja Turtles theme)! College credit nor CEU's are available for ALSC Student Sessions at this time. To take part you must have a computer, Internet access, web browser, and a copy of Flash® Player 8 or higher. You can download a free copy of Flash® Player from the Adobe website if you do not already have it. For more information, view a video about Abode Connect meetings produced Adobe. To sign up for this webinar, please fill out the registration form. Registration is free. Participants must register before Monday, March 24 at 4pm Central. A few days before the event, registrants will receive an email with a direct link to the forum. For more information, please see the contact information below. I'm in Indianapolis at the 2014 PLA Conference today presenting a session with Rhonda Puntney Gould, library advocate extraordinaire. Our session is titled Be a Champ! 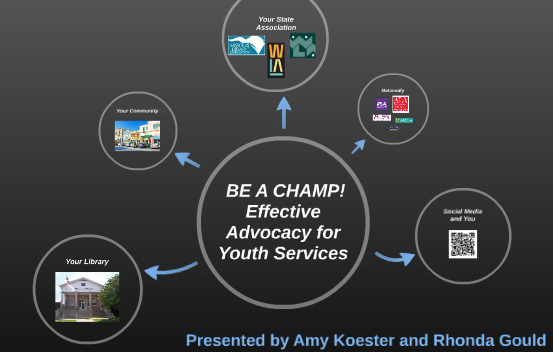 Effective Advocacy for Youth Services, and it's meant to inspire all manner of youth services personnel to use their storytelling skill set to advocate for their departments, their libraries, their customers, and themselves. Throughout our presentation, we're talking about a number of outstanding resources that can aid advocates as they go about their work. All of these resources, plus plenty more that we love and recommend, are available on our presentation Pinterest page. Rhonda, Marge Loch-Wouters (who was originally supposed to present with Rhonda, but, life) and I will continue to add to this board as we collect more resources. I do want to highlight a few key resources here, however, to get you started thinking about how you can be your best advocate. Advocacy University - From ALA, this compilation of resources covers everything from how to start being an advocate, to quotable facts about libraries, to strategies for advocating for different types and sizes of libraries. Pew Internet: Advocacy Tools for Librarians - This site, available through WebJunction, compiles all of those Pew studies that share quantitative data about the use and value of libraries. Turning the Page 2.0 - This online course from PLA is available in its entirety to get anyone started advocating. Colorado Libraries for Early Literacy - The CLEL advocacy page is overflowing with messages just begging to be shared with administrators, library customers, community members, legislators--everyone! Growing Wisconsin Readers - Use the excellent information on this site to help craft brief, powerful messages about early literacy and the work the library does to support parents as they help their children develop early literacy skills. Don't forget to check out the resources for librarians for even more good stuff. Everyday Advocacy - This initiative of ALSC gives ideas and bite-size advocacy projects that any youth services librarian--any librarian, really--can implement from the reference desk on any given day of work. This is a new initiative, so more content is added all the time. Storytime Underground - Looking for a community of folks with whom you can share, commiserate, and swap strategies for effective advocacy of youth services? Peruse the Storytime Underground, a community of youth services advocates who stand fully behind the expertise that is serving children in the library. Every Library - The only registered Political Action Committee (PAC) for libraries, Every Library has made a huge different in election campaigns that could have been severely damaging for libraries all over the country. National Library Legislative Day - Every year, library advocates descend on their elected officials to make sure they understand just how necessary it is for the communities they represent to have vibrant libraries--and how important it is that their votes reflect that reality. What are you waiting for? Tell your story and get advocating! The Show Me Librarian is 2! Today marks the second anniversary since I began blogging about library things here at The Show Me Librarian. In that time, I've shared lots of books, programs, thoughts, and conference takeaways, and I have every intention of continuing to share to the best of my abilities. I've heard from many readers who have said that they find this blog useful as they do and think about their jobs. As long as sharing here can have a positive impact on even one colleague, I'll keep doing this. We're a sharing, collaborative profession, and I'm happy to share and collaborate. 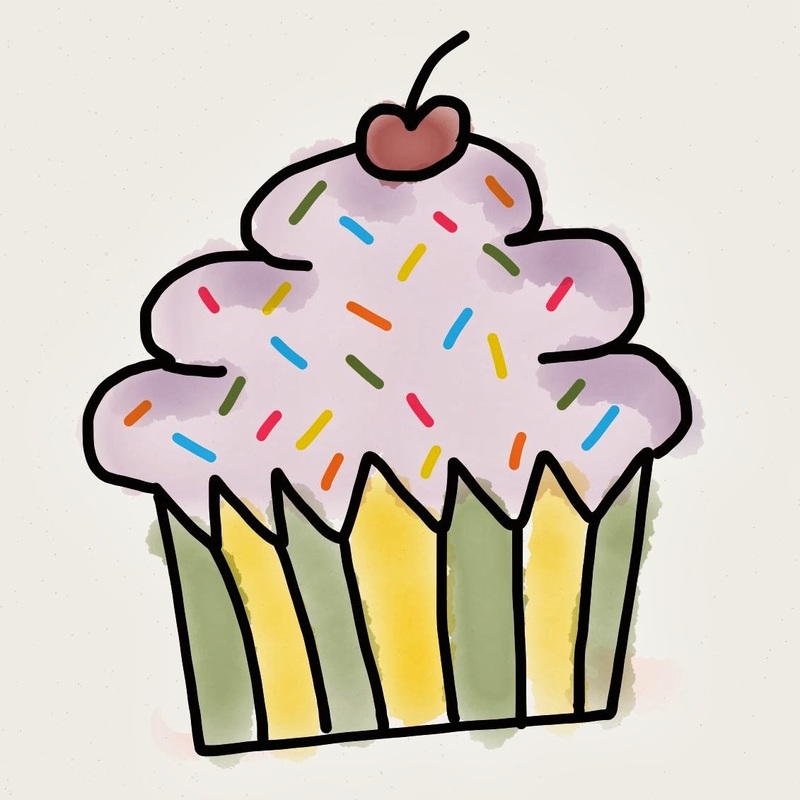 So thanks to you, dear readers, for helping me get to this second blog birthday by reading what I've put up here! I'll mark the occasion with a cupcake or glass of champagne, and I wouldn't think any less of you if you indulge, too. 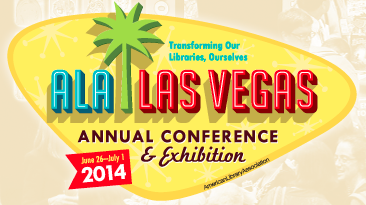 Vote for #alaac14 Conversation Starters & Ignite Sessions! The slate of possible Conversation Starters and Ignite Sessions for the 2014 ALA Annual Conference this summer has been announced, which means that it's time for folks like YOU to vote for the sessions you want to see take place in Vegas. There are a ton of great options, and I encourage you to take ten minutes or so to look through them and cast your vote. Voting takes place between now and March 31 and will count for 30% of the selection process. I'd also like to draw your attention to two Conversation Starter proposals in which I have a part. If either sounds like a session you'd be interested in seeing come to fruition, log in to ALA Connect (you don't need to be an ALA member to have an ALA Connect profile!) and give it the thumbs up. Storytime presenters can get caught up in books—we’re librarians, after all! But reading is only 20% of the ECRR2 early literacy practices; the initiative asks us to sing, talk, play, and write as well. That means we should be spending at least as much time planning our songs and our play, letter knowledge, and response activities as we do planning our books. Join the Storytime Underground Joint Chiefs to learn about great storytime resources and share your best practices for widening parent and child horizons when it comes to early literacy. Parachutes, felt boards, and beyond! Vote for "Storytime: Not Just Reading Out Loud" here (you'll need to log in to ALA Connect to give this session your thumbs up)! Makerspaces aren’t all 3D printers. At their core, makerspaces are about a simple maker attitude: to foster exploring new skills and creating in the library in meaningful ways. You may be surprised to find that making is already in everything you do--and if it isn’t, it can easily be incorporated. Join us to learn about how libraries are making everyday, including examples from the Chattanooga Public Library, Darien (CT) Library, and more. Explore a range of makerspace mentalities, including low- and medium-tech examples and ideas for tapping potential partners in your community. When you return from ALA, you’ll be able to grab some duct tape and glue and help your community start making! Vote for "We Make Everyday" here (you'll need to log in to ALA Connect to give this session your thumbs up)! I'm headed to Indianapolis today for the 2014 PLA Conference. I am very, very excited to be able to attend a variety of sessions at this conference to contribute to my own professional development, and I anticipate that I'll be bringing a wide variety of ideas and resources back to my library after the conference. I will most definitely share these takeaways in a wrap-up post next week. I'll also be one of several librarians live-blogging the conference on the ALSC Blog, so you may get some sneak peeks at my takeaways over there throughout the week. For now, however, I want to focus on some of the things that I've got going on while I'm in Indy. By all means, if any of them sound of interest to you, I'd love for you to attend. Join fellow storytime ninjas & guerrillas on Thursday, March 13 from 12:15-1:30 p.m. for lunch. The meet up will happen at The Landing on Maryland Food Court in the conference center (that way no one’s plans to attend sessions are disrupted). I’m pretty sure you’ll be able to spot the SU-ers in the food court, as we tend to form an excited mini-mob whenever more than three of us are in the same place. As per the PLA program listings, Spark Talks are "fast-moving sessions featur[ing] five-minute presentations on the latest and greatest ideas from your public library colleagues. Come be surprised, inspired, and energized!" I will be presenting my Spark Talk at precisely 4:27 p.m. It is titled "Guerrilla Professional Development: Put Collaboration to Work for You and Your Library," and my hope is that it will allow more libraries to consider mining the valuable expertise in their organizations when it comes to trainings. This session will take place in Indiana Convention Center Room 106. This ConverStation will open with Brooke Rasche and myself briefly introducing the ideas behind and value of Guerrilla Storytime--hopefully inspiring attendees to take the model back to their libraries, state associations, etc. Then we'll get into the meat of why Guerrilla Storytime has proved valuable to so many youth services librarians: time to share our experiences and expertise as we weigh in on the challenges of real, live, on-the-ground storytime practitioners. This will be a full-on, participatory Guerrilla Storytime! This session will take place in Indiana Convention Center Room 102. As per the program description: "Be a champ by advocating for youth and youth services at your library! Learn how to advocate internally within your organization and with your local elected officials, as well as how to influence stakeholders and legislators at the regional, state, and national level. You’ll also discover how to relay your message through your social network sites, blogs, and newsletters." I'll be co-presenting this session with Rhonda Puntney Gould, who is a tremendous advocate for libraries and youth services folks in particular. She designed the session with the uber-knowledgeable Marge Loch-Wouters. I'll be standing in for Marge in this session, as she's not able to make it to Indy. And while I'm no Marge, I shall do my best. This session will take place in Indiana Convention Center Room 133-134. There's been such a volume of folks talking about STEM and STEAM online lately that I've been adding resources to my All Things STEAM page on a near-weekly basis over the past few months. With so much new material, and with so many libraries looking for STEAM ideas as they plan for "Fizz Boom Read" summer reading programs, I want to draw some attention to a few excellent resources that you may not have seen yet. Little Makers at the Fayetteville Free Library - With a designated "Little Makers" space in the library and an assortment of write-ups for successful programs--on STEAM topics like space, circuits, snow, and book-making--Little Makers at the Fayetteville Free Library offers a great look into how any library can host a relatively small and simple STEAM initiative for youth. S.M.Art Kids at Radnor Memorial Library - Programs from the S.M.Art Kids series at Radnor demonstrate just how engaging science, math, and art can be for kids when they're present in library programs. The most comprehensive array of programs on this site fall into the "Art Explorers" category--plenty of room for scientific method and asking questions to figure out how different styles of art work--but the handful of "Time Travelers" programs are great, too. 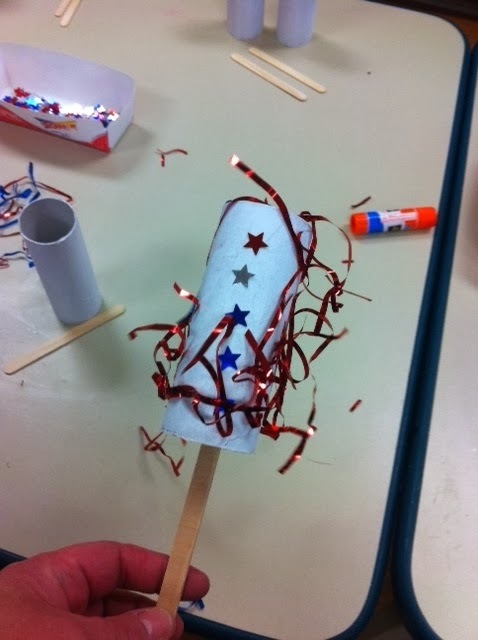 Science Sparks - Looking for ideas for activities to add to your upcoming STEAM programs? Science Sparks has plenty of options for libraries looking to engage both preschoolers and school-age kids in hands-on exploration of science. 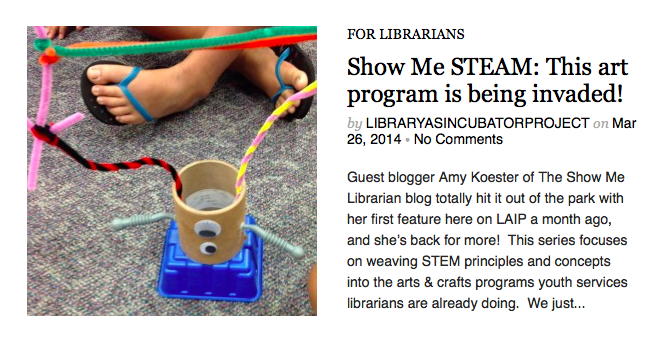 What's STEAM, and Why Do it in the Library? What does STEM look like in preschool and what is STEM anyway? - This post on the "Teach Preschool" site is a bit older, but its content is great for anyone looking to justify STEAM or find age-appropriate STEAM activities for preschool programs. After she introduces what hands-on STEM is and why it's necessary for preschoolers' intellectual development, Deborah J. Stewart, M.Ed. gives some tips for folks who serve preschoolers to integrate STEM into what they do. Q & A with David Cole: Why We Need the "A" in STEAM - Cole, an educator and curriculum developer in California, succinctly summarizes one of the big benefits of adding that arts/creative aspect to the STEM content areas. Bonus: he also touches on that whole maker thing. NSTA Position Statement: Early Childhood Science Education - The National Science Teachers Association released their official position statement on early childhood science education--namely, what it is, what it should look like, and why it is absolutely vital if children will be able to reach their full potential in science once they start formal schooling. Some of the bulleted items in this position statement are begging to be used as soundbites for parents and administrators who may be wondering why STEAM belongs in a library. Have you found any STEAM resources of note in the past few months? If so, share them in the comments, please! 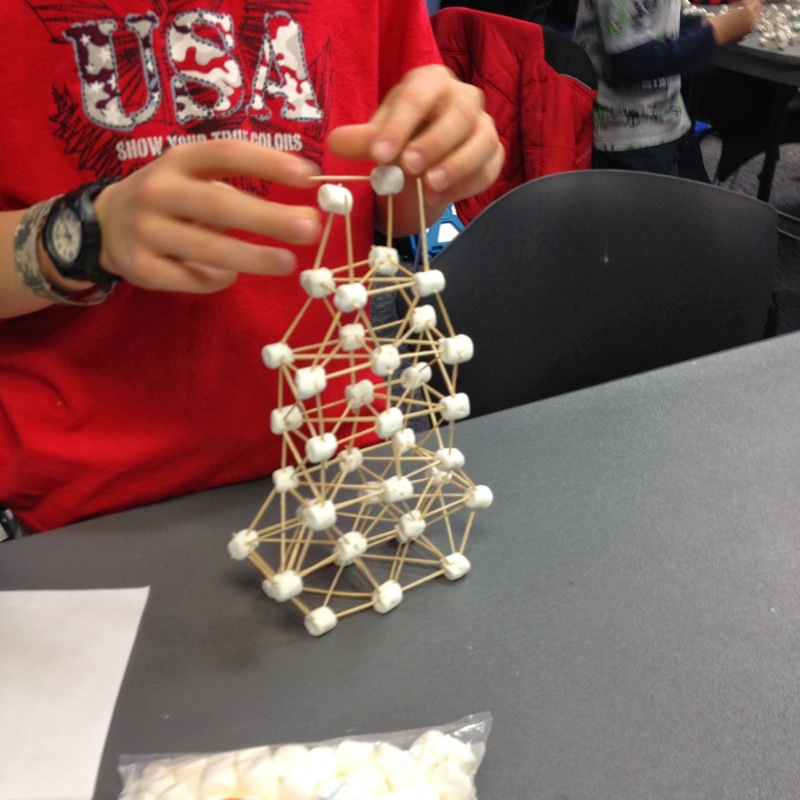 I'm over on the ALSC Blog today sharing details of my recent "Marshmallow Towers" program for the school-age crowd. Now, my ALSC Blog posts usually focus on the "S" in STEAM; that is, so far the programs I've shared there have been all science-based. "Marshmallow Towers," on the other hand, focuses more on the engineering and creativity/arts aspects of the STEAM acronym. Just another way to engage kids in creative thinking and problem-solving while exploring STEAM content areas! Head over to the ALSC Blog to get full details of this not-as-sticky-as-you'd-think program. How did you celebrate World Read Aloud Day 2014? March 5 was World Read Aloud Day, a day for promoting the joys of literacy for everyone worldwide. As part of our festivities at my library, we hosted a special program: Read with a Police Officer. The premise of the program was to have a recognizable community figure come to the library to read a story aloud, talk about why they love to reading and why reading is important to them, and then answer kids' questions. Officer Ochs of the Lake St. Louis Police Department came to my branch completely ready to read--what else--Officer Buckle and Gloria. Officer Ochs is the police officer in our town who visits lots of schools and daycares, so she's well versed in dealing with kids. She even has her own copy of Officer Buckle and Gloria, as it's one of her favorite stories to share with kids. After she read Officer Buckle and Gloria to the kiddos in attendance--both preschool- and school-age--Officer Ochs talked about how she needs to read to be able to do her job, and that she enjoys reading stories for fun, too. Then she asked the children what they want to be when they grow up. As the kids responded (president! ninja! firefighter! musician! librarian! ), she reinforced how important literacy is by mentioning that each and every one of these jobs will include reading. Officer Ochs's portion of the program wrapped up with a Q&A, with the kids asking her questions about her job. 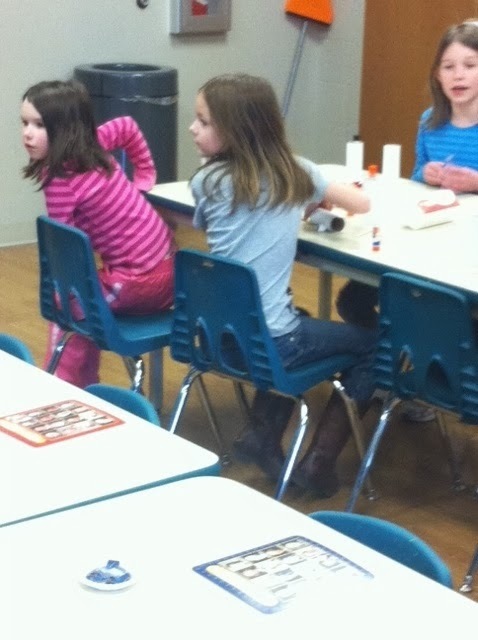 They asked some great questions: what's on her utility belt, and why is it included? what are the patches on her uniform for? how many bad guys has she stopped? The kids were absolutely riveted as they listened to the answers from a real, live police officer. I finished up the program by tying everything back to World Read Aloud Day and how much fun it is to share stories out loud. From there, the kids could add their favorite read-alouds to our celebration poster. I had die-cut books in a variety of colors, as well as lots of markers, for kids to write down their favorite stories before taping them to the poster. That poster is now hanging from the reference desk at my library, in clear line of sight of almost everyone who visits the library. 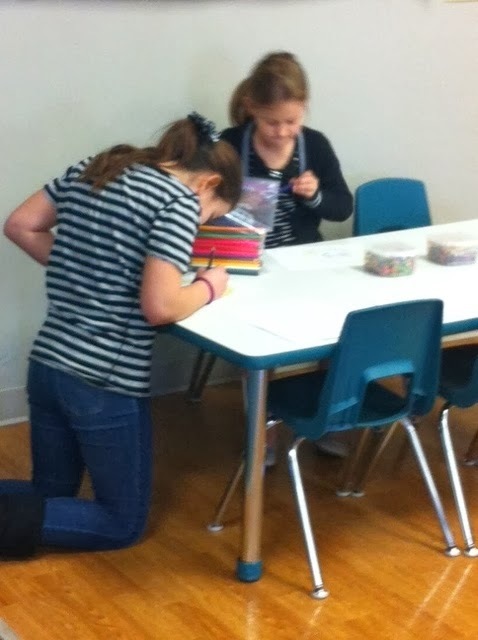 Others can add their own favorite read-alouds to the poster, too. That's how we celebrated World Read Aloud Day at my branch library this year: with a community helper reinforcing the importance and joy of literacy right alongside me, the librarian. Kids had fun, shared stories, and then checked out books to read at home. All in a good day's work! How did you and your library celebrate World Read Aloud Day? 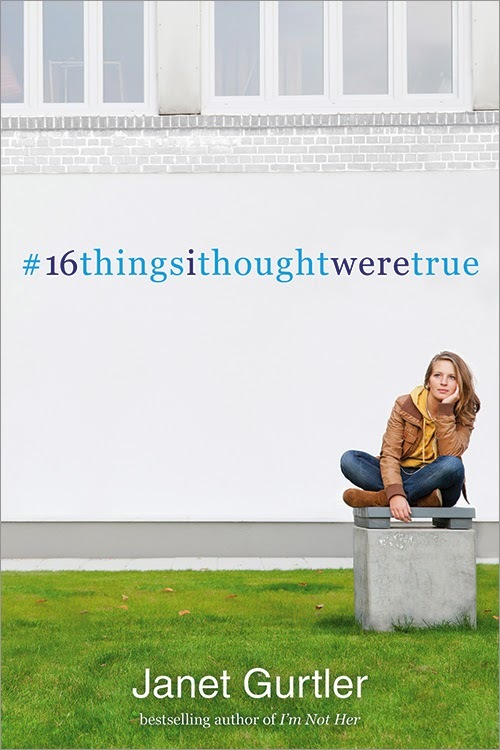 Today is the release day for Janet Gurtler's new young adult fiction title 16 Things I Thought Were True. I'm excited to get to read more books that are strictly young adult this year, and Gurtler's novel was a great, fun book in this category. The Synopsis: Morgan is working at an amusement park during the summer before senior year when her mother has a heart attack. Morgan's already been having a tough summer--she lost all of her friends after a video of her went viral. When Morgan's mother, fearing death, finally tells Morgan the name of her father and where he lives, it's like Morgan's entire world has shifted. She wants to meet and confront her father, and she decides to road trip to Canada to do just that. Luckily she doesn't have to go it alone, as Amy and Adam, two of her amusement park coworkers, offer to be with Morgan along the way. Can Morgan deal with everything happening in her life? The Review: I loved how quickly I was able to get into Morgan's head, feeling her confused rush of feelings about her mother, her stranger of a father, and her friends (or her perceived lack thereof). The three major teenage characters really are well fleshed out, each complex enough to make the occasionally melodramatic plot interesting without weighing it down. Gurtler does a pretty good job with the pacing, too; while some conversations seem a bit hurried and could be more developed, the overall feeling of life moving at a complicated, frantic pace really mirrors Morgan's state of mind. 16 Things I Thought Were True will appeal to a variety of teen readers, as teens can see parts of themselves in Morgan--cynical, not as confident as she wants to seem--, Amy--cheery, unapologetically honest--, and Adam--well-meaning, trying so hard to be the excellent student and citizen he thinks people want him to be. There's lots to captivate in the road trip and personal drama plot, and plenty more to enjoy in the characters. The Programming Connection: I'll be book talking this title to teens during readers' advisory interviews and chats with Teen Advisory Board members. It would make a great addition to a book list of young adult titles with a road trip theme, too. Today's guest blogger is Kathleen Connelly-Brown, Library Assistant II at Rogers Public Library with 8 years experience, 6 of those in the children's department. Kathleen got in touch with me after she attended the Wild Wisconsin Winter Web Conference webinar that Marge Loch-Wouters and I gave on the topic of unprogramming. I admired Kathleen's enthusiasm for thinking about programs for kids, and I asked her if she'd be willing to share her thoughts and first experience with unprogramming. Today we get to hear about unprogramming from her. Take it away, Kathleen! 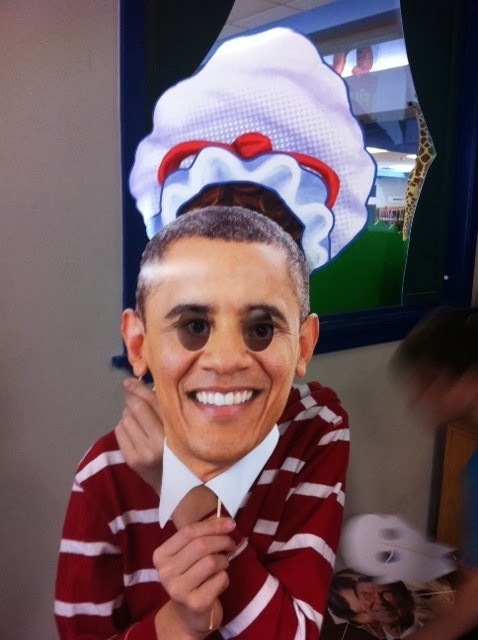 This crafter dubbed his costume "Obama Baby." to explain some of the colonial garb. The program I specifically used this approach for is called Expert Hour, which we started during Summer Reading Club of 2012. This program began as a way to offer special programs focusing on the arts and sciences for older kids, sort of a workshop-type program during SRC. We began with staff utilizing or teaching a special skill that they had, as well as a few paid presenters. Prior programs have included illustration lessons, cake decorating, comedy improv, intricate crafts, and a juggling workshop. We continued the SRC-only option during the summer of 2013, but we have now morphed the program and are offering it all year long. In the fall of 2013 and spring of 2014, we offer a Homeschool Expert Hour for kids age 5-12 at 2pm once a month, and an After-School Expert Hour for kids age 5-12 at 4pm once a month. February was my turn to lead the program, and I opted to incorporate history (a passion of mine) with traditional crafts and literacy elements. 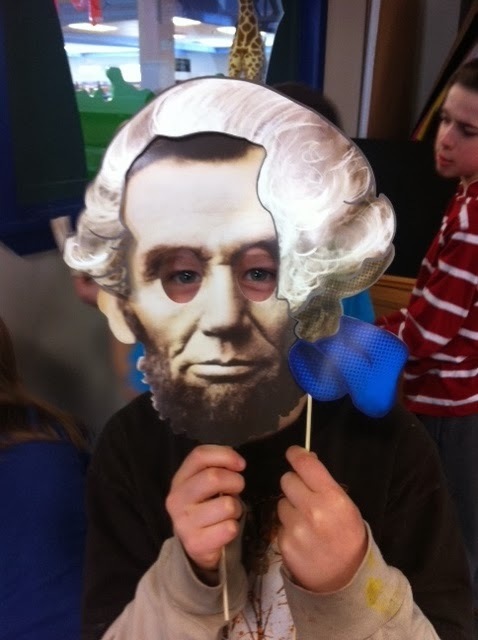 February Expert Hour focused on the Presidents of the United States. My original plan began with the dreaded powerpoint presentation. There were to be lots of slides sharing information about the presidents past and present, some fun facts about several presidents, and a description of how one becomes president including facts about the election process. I found a neat website that would allow us to take a virtual tour of the White House, and I planned to show that to the kids. I had a craft in mind to add at least one element of what a typical program looks like: share some info, make a craft, go home. Sounds really boring, right? The more I planned, the more I got bored with my own presentation! I was really at a loss as to how to make this fun for the kids. I did not want to get trapped in the theory that history is dry, boring, and a total snooze-fest, much like I remembered it from school. In fact, I didn’t want this to be like school; I wanted it to be fun! I wanted the kids to see how much fun the library can be and how many cool resources the library has. My original plan lacked both of these messages I wanted the kids to come away with. Jump forward to January and the 2014 Wild Wisconsin Winter Web Conference! I heard about the conference ahead of time from reading this blog, and after reading the words “free” and “virtual” I decided to sign up. I’m so very glad I did! I was really interested in Amy and Marge Loch-Wouters's presentation “Unprogramming: Recipes for Successful Programming with School-Age Children and Teens.” I wanted to know how unprogramming could work at my library. How I could plan a program without spending weeks on it and pulling my hair out? How do I incorporate ALL the THINGS with very little planning and stress??? I had my doubts. But, as I watched and listened to these two super-smart ladies explain the process, I had an epiphany. I didn’t need to stand in front of the group and tell them stuff. I didn’t need to hold their hands and lecture them on how history was cool. I didn’t need to have everything so detailed and specific that the kids in attendance were being shown the information as passive bystanders. I only needed to be a facilitator; the kids are smart enough and curious enough to be given some options and the discovery can begin with THEM taking the lead! Brilliant!! I immediately reconfigured EVERYTHING. I shortened my powerpoint to four slides, one of which was a breakdown of all the cool stuff there would be to do after I shut up. I added a non-fiction read-aloud to begin the program as a way to present some of the information that was included on my previous slides. I kept one slide with a fun fact (Grover Cleveland was the 22nd and 24th president. Technically we have only had 43 different presidents, although Barak Obama is considered to be our 44th president – cool, right?). Our Children’s Director began to get excited about my plans and ordered a Presidential Bingo game from Oriental Trading. She also ordered some costume props the kids could use: faces of presidents and colonial garb to play and experiment with. I pulled all the books on presidents that we had to create a table display to encourage the literacy component and the hope that kids would take the books home. 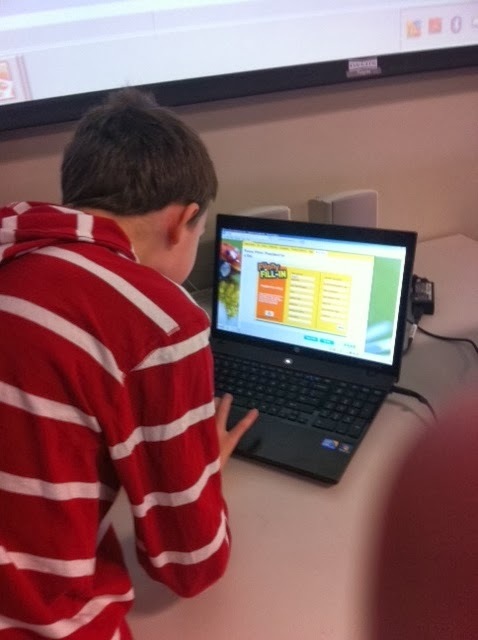 I pulled a few laptops and set them up with different websites: the virtual White House Tours, a Colonial Williamsburg website with games to play, a National Geographic website with fun facts, and a Presidential Mad Lib type game. I printed out some fun word games, coloring sheets, and writing prompts to create a ‘writing center.’ I kept the craft, but had it as yet another optional activity for the kids to do. Now I had a program that included about ten minutes of me talking and lots of stations for the kids to explore on their own. As I called the presidents' names for Bingo*, I looked around the room and saw engaged, happy, bright-eyed children having FUN. And all it took was 20 minutes of room set-up (with a helpful volunteer) and 20 minutes of room clean-up (with a helpful coworker). I spent more time planning than Amy or Marge probably would have, but it being my first attempt at this style I’m ok with that. It was still MUCH less time (maybe two hours) than I would have spent using my old methods (days or weeks of planning). But mostly, the STRESS was non-existent, or close to it. I was worried there would not be enough to do – it turns out there wasn’t enough time! I was worried this new style wouldn’t go over well – what a non-concern that turned out to be! The kids had more fun during this program than many of the others I have planned and presented. To me, that is the key – the fun, the learning, the discovery – that the kids can find for themselves when utilizing the unprogramming idea. They did this, they were empowered, they were excited, they learned, they discovered, they experimented. So much of what we do in the Children’s Library is focused on these goals – leading the kids to discover new things. If I had planned and structured the program using my old methods, this discovery would not have happened the same way. Success!! Thank you Amy and Marge, for making my job more fun, easier, and less stressful. *So as not to come away without at least one total fail, I share this story: During the fun fact about Obama being the 44th President, one six-year-old boy states “He’s the devil!” upon hearing Obama’s name. Color me shocked! Another boy, age 9, said “No he’s not.” The first boy said “Well, he’s Muslim and that’s bad.” The older boy said, “Well, actually, some of his family is Muslim, but Obama is a Catholic.” I finally recovered from shock and said, “Ok, well moving on.” During Bingo, one card was Obama and Mr. 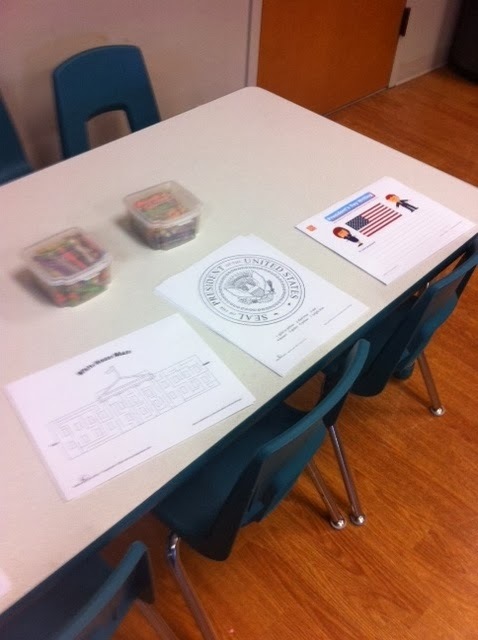 Six-year-old at the craft table beside us said “He’s a bad man!” while Mr. Nine-year-old and two others say “No, you are wrong.” To avoid any further controversy I said “Regardless of what we think of the man, he is the President of our country so let’s be respectful of that. There are deeper issues that reflect the political stances of each of our presidents, which we don’t really have the time to get into. Let’s just say that Obama is our President and keep it at that for today, ok?” Both boys seemed to be ok with this and there were no further incidents. I should point out that this area of Arkansas is deeply conservative and very Christian. I’m sure Mr. Six-year-old has overheard some lively conversations at his house and wanted to enlighten the group. We were having a grand time of sharing information after all. Guest blogger Kathleen Connelly-Brown's main duties include baby storytimes for ages 0-24 months, as well as tween programming for ages 8-12. She also functions as the Volunteer Coordinator for her Children’s Department. Her library has a staff of five (three full-time, two part-time), and one page. The Rogers Public Library is a large suburban library serving the town’s population of nearly 58,000 and the surrounding communities. All photographs provided by the guest blogger.